Congrats to all the commenters who got picked! There were a lot of excellent questions, and it was tough to whittle down the candidates. These questions will be joining last year’s “If your game had a super-deluxe version that cost $1,000, what would be in the box?” as part of our 2014 questionnaire. All the selected commenters should go ahead and email their mailing address to John Teti, jteti [at-symbol] theonion [dot] com, so we can send along Gameological pins and some other arguably fabulous prizes. Our characters’ journey through the World Of Ruin is one thing, but what truly made the game’s apocalyptic saga hit home were the stories of the world’s non-player characters. Seeing hopes and dreams crushed or realized for the many denizens of the world expanded the scope of the destruction that Kefka created. Duane and Katarin, a young teenage couple happy to be in their goofy, naïve love, all of a sudden have to face the realities of parenthood, both through the orphans that they care for and their own, unplanned pregnancy. A man with hopes of running a coliseum has those dreams realized only due to the violent nature of the world. Ultros, the octopus whose sole purpose was to torment and fight, now finds himself working as a receptionist at said coliseum. The impresario of the opera can’t see his performances go on due to a dragon being on the stage. A young woman who was writing letters to her soldier boyfriend has no idea that he has already passed away. Fortunately, the game isn’t content to just tell you about how sad their stories are and use it to inspire some incomplete sense of despair. These characters get closure for arcs, brought about by our hopeful band of heroes. Cyan tells the woman the truth of her boyfriend’s passing and encourages her to keep strong in the world and not give up hope. The party slays the dragon that is ruining the Opera House. And, as the credits roll, Duane and Katarin’s child is born into a new world of hope, brought about by our party. 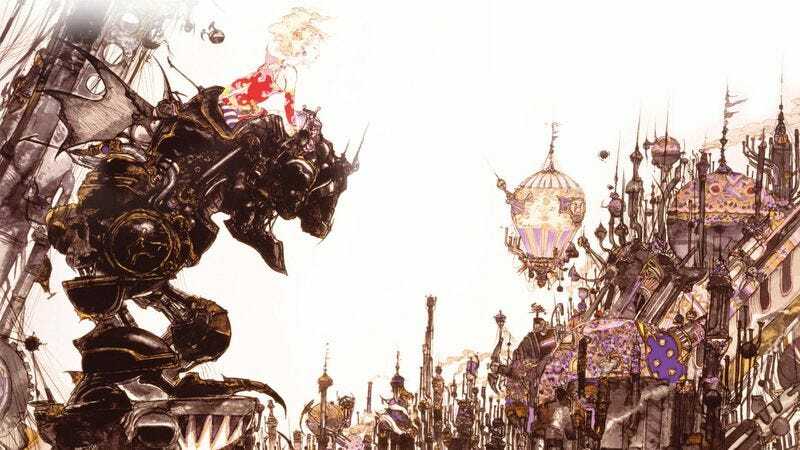 The fact that Final Fantasy VI gave us a human world to save, instead of giving us a lifeless hunk of land, is one of the most simple yet often overlooked aspects of good storytelling, especially in games. After all, what good is taking down the bad guy if all you did was kill someone because they were mean? The characters and world of this game actually gave it purpose and drove home all the emotions that the rise, fall, and rebirth of the world demanded. I can’t think of any other game that nailed the idea of an ensemble cast more perfectly than FF6. Any character could theoretically have been killed off or written out of the story, and the game world would hold up without them. Similarly, the perspective could shift to any member of the ensemble, and it wouldn’t feel out of place. That’s a testament to both the strength of the characters and the power of building a game world that doesn’t feel like it will stop existing the minute you stop observing it. Role-playing games often suffer from having a central hero who gets to visit every corner of the world, slay every monster, deliver everyone’s mail, and become The Most Important Person In The World™. An ensemble gives you a team made up of independent personalities and motives, instead of one All-Powerful Dude and his sidekick pals. I know it’s argued that the game has no real main character, but I’d say its two most important heroes are both female. One of them has no romance subplot, and while the other one does, it’s not your typical Japanese RPG romance. You have to hand it to them for having great female characters as well. I wish more games would look to a game like this, a 20-year-old game, to see how you can avoid making your female characters into a boring cliché. It’s okay to have your characters start off as insecure, weak-willed and unsure of themselves (like Terra), or to start them off as highly accomplished bad-asses (like Celes), while also recognizing that they’re full characters with other sides to their personalities. I think the game is unique in the series for having a pan-Asian influence in its world and design. Instead of pan-European high fantasy or gritty robotic futurism, it’s a really interesting mix of Asian influences: Indonesian batik fabrics, a Nepalese-style mountain village, Japanese kimono silhouettes, Hindu-inspired gods and religious iconography, South East Asian-style fishing villages. It’s really nice to see the series try something besides European high fantasy (even though I love it) and Japanese high-tech futurism. Besides all that, I do like the plot and characters very, very much. I enjoy that no one in your party is irrelevant to the main character. They all mean something special to her. I’ll be a fan of Yuna’s character until after I die, basically. She is amazing. My father took his own life a few weeks after FF6 was released. My child’s mind was still processing Celes’ attempted suicide and the dark turn into the World Of Ruin when I was suddenly faced with a painful real-life echo of the game. The aching theme that plays when Celes finds Cid dead still transports me back to my own moment of discovery. FF6’s apparent prescience about my situation led me to play the game over and over again for the rest of 1994. I don’t think the many adults in the house really understood why I was playing a video game on repeat. FF6 is among the darkest games in the series and hardly the feel-good experience one might expect to turn to in the aftermath of a traumatic event. With character after character, the game insisted that loss and sorrow are unavoidable. Yet I gradually was able to internalize the game’s theme that one must accept loss and find something else worth living for. With this message, the game became a knowing and reassuring presence, if not quite a comforting or enjoyable one. I doubt Sakaguchi, Uematsu, and the rest of the developers had any idea that they were producing kid-friendly trauma therapy, but honestly I can’t imagine having gotten through that period without FF6. It’s a strange coincidence that it was there to provide answers to the very problem I was having, at a time I was young enough to see no issues with turning to a video game for answers to life’s questions. That’s the end of another Gameological week. As always, thanks for reading and commenting. E3 is next week, which means I’ll be out in L.A. playing some games and talking to some cool people and telling you all about it. Ryan Smith will be joining me for coverage as well, and John Teti will hold down the fort in Chicago. We’ll see you then.